The Supreme Court Thursday expressed its displeasure over the Centre not disbursing funds uniformly among the state governments for development and upgradation of infrastructure in subordinate judiciary. A bench headed by Chief Justice Ranjan Gogoi asked the Centre to ensure that the funds should be distributed uniformly in accordance with its policy decision under which a scheme has been envisaged that the union and the state government would share the funds in the ratio of 60:40 for development of infrastructure facilities for judiciary. 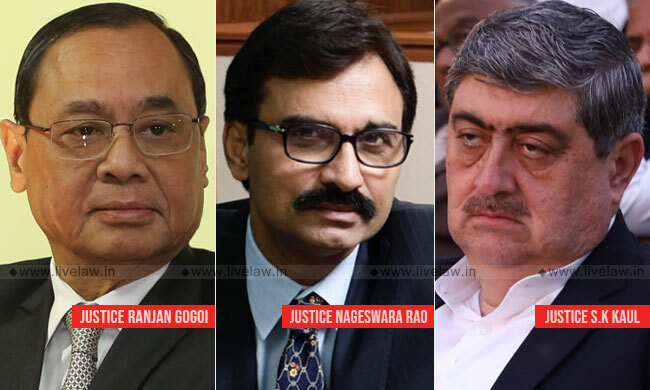 The bench, also comprising Justices L N Rao and Justice S K Kaul, passed the order after senior advocate Vijay Hansaria, who is assisting the court as an amicus curiae in the matter, said theo and S K Kaul, passed the order after senior advocate Vijay Hansaria, who is assisting the court as an amicus curiae in the matter, said the Centre was not distributing the fund uniformly to all states and gave example of Bihar which received Rs 204.03 crore in last four years, while Odisha did not receive any fund in last five years under the scheme. When the senior advocate along with advocates Sneha Kalita and Avnish Pandey, was making the submission, the bench said there was a need for an order to ensure that the scheme is implemented uniformly in all states. Since Solicitor General Tushar Mehta was present in the courtroom, the bench asked him "to make sure that there is a uniform disbursal of funds". Mehta assured the bench that he will look into the matter with Hansaria and take necessary action. Hansaria also apprised the bench that there was a huge shortage of residential accommodation in the states, and while most of the states reimburse full rent to the judicial officers in case of non availability of government accommodation, Bihar and Odisha only reimburse 10 to 20 per cent of basic pay towards rent. Taking note of the issue, the bench directed the high courts of Patna and Odisha to do the needful. The apex court on Thursday was perusing the reports relating to Madhya Pradesh, Tamil Nadu, Puducherry, Bihar and Punjab, Haryana, Chandigarh and Odisha. The top court was informed that state governments and concerned high courts have expedited with filling of vacancies and infrastructure activities only after its December 5, 2018 order. It is also monitoring the steps taken for developing the infrastructure in subordinate judiciary. Divan would deal with the vacancies and the processes needed to fill them up in Uttar Pradesh, Maharashtra, West Bengal, Chhattisgarh, Delhi and the Northeast states.